Has the hustle and bustle of life got you down? Well if it has, we have the perfect cabin for you! BEARADISE! This secluded log cabin is located 3200 ft. above sea level on the side of Phoenix Mountain, just outside of West Jefferson. 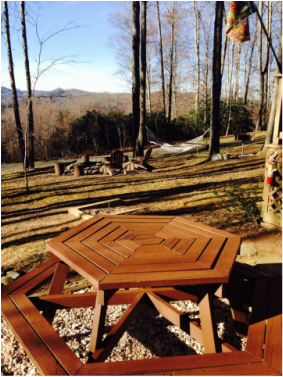 It boasts beautiful views of the mountains, pond views and is within a short walking distance to the New River. This cozy two bedroom, one bath cabin which sleeps up to six people, comes fully equipped with everything you need to enjoy a relaxing, peaceful and memorable vacation. 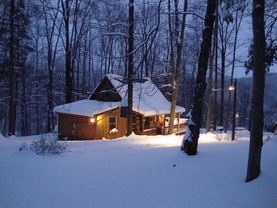 The cabin is fully furnished, linens included, all kitchenware provided and has dining for six. 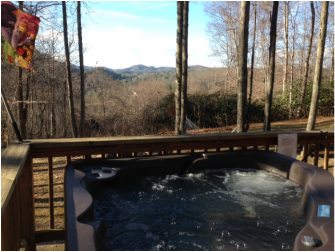 Relax in the tub, read a book on the deck, surf the internet, watch a DVD from the DVD library, lounge in the outdoor Fantasy Spa with LED lighting, have a cup of coffee in the gazebo or just enjoy a nice walk through the trails. There are plenty of activities to keep you busy. You'll discover many fine restaurants, championship golf courses, winter ski resorts, antique and craft shops and many cultural events. You can go fishing,canoeing or tubing on the New River or visit Mt. Jefferson State Park. Mast General Store in Valle Cruise, Linville Caverns and much more! Bearadise is also conveniently located near the Tennessee-Virginia border. 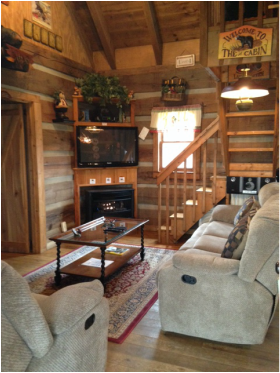 Bearadise is the cabin for you! 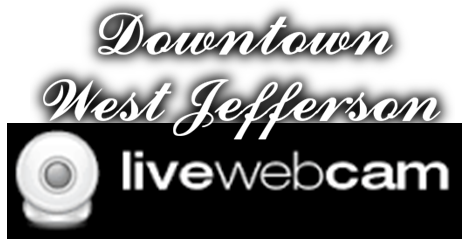 no "processing" or "reservation fees" and no expensive security deposit! Activities Guide & local attraction brochures. Outside hot with LED lights.